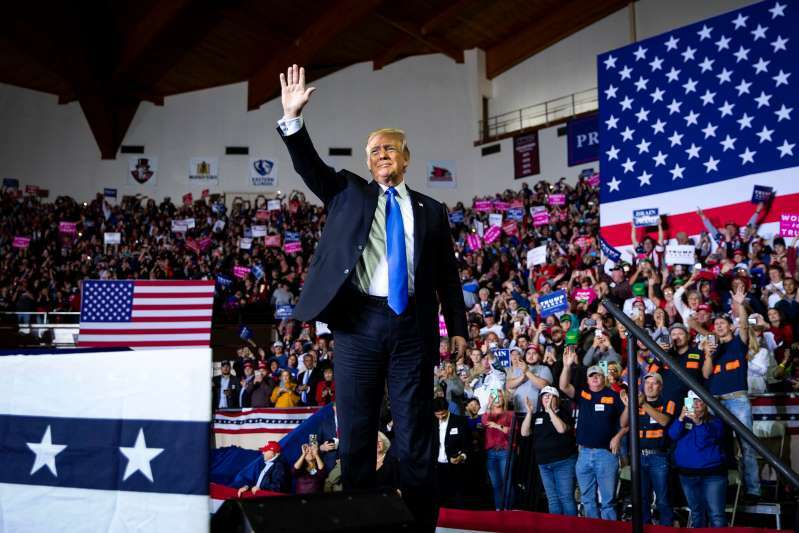 © Al Drago for The New York Times President Trump on Saturday at a rally in Richmond, Ky.
President Trump’s campaign more than doubled its spending over the past three months as the president worked to rev up the Republican base ahead of next month’s midterm elections through a series of rallies and online appeals. The increased spending — much of which was done through an opaque new corporate entity set up by the campaign — was reflected in filings that the campaign’s committees were set to submit on Monday evening to the Federal Election Commission. The filings showed that the campaign spent a total of $7.7 million from the beginning of July and to end of September — more than twice the $3.6 million spent in the preceding three months — according to a preview of the filings provided to The New York Times. The campaign and two joint committees it formed with the Republican National Committee raised a total of more than $18 million in the last quarter, a slight increase over the preceding quarter. The committees ended the quarter with nearly $35.5 million in the bank. That is down significantly from the $54 million they had at the beginning of the quarter, but it will still give Mr. Trump a substantial head start over any of the prospective Democratic rivals expected to start campaigns after the midterms. The increase in spending has paid for an investment in the type of campaign staffing and digital operation that Mr. Trump largely eschewed early in his 2016 campaign, but that his Democratic rivals will have to scramble to build to take him on in 2020. The largest recipient of Trump campaign funds was a company called American Made Media Consultants, which was created by the campaign to purchase digital, radio and television advertising, including online fund-raising solicitations. The company, which is controlled by Trump campaign officials, was set up this year in consultation with its law firm, Jones Day. It is not intended to turn a profit, but rather to save the campaign money by acting as a clearinghouse for spending that would otherwise be done by outside vendors who typically take commissions on such purchases. The model, which is patterned off one pioneered by Mitt Romney’s 2012 presidential campaign, could also allow the campaign to avoid disclosing to the election commission precise details about its spending, instead just listing line-item expenditures. Monday’s report showed 19 payments to American Made Media Consultants totaling $1.6 million. The setup is also intended to reduce the amount of spending done through the companies of the campaign manager, Brad Parscale. His firms were paid nearly $88 million by the campaign in 2016, when he served as digital director and drew grumbles of self-dealing, though most of that money most likely was passed through to Facebook and other platforms for ads. Mr. Parscale’s company was still paid $564,000 in Monday’s report, which Mr. Parscale said was mostly for salaries and overhead for company staff members who are working on the Trump campaign. Other significant payments included $1.3 million to Jones Day, which handles the campaign’s election compliance but also represents it in matters related to investigations of Russian meddling in the 2016 campaign. And the campaign paid $604,000 to Ace Specialties, a Louisiana company that manufactures much of the Trump campaign’s merchandise, including its distinctive red “Make America Great Again” hats.